As featured on Rick Bayless Newsletter! 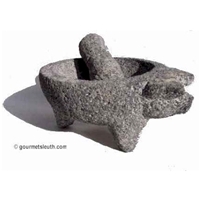 Although not what we think of as the "traditional" pig molcajete y tejolote, Rick Bayless likes these "smooth stone" basalt pieces for their ease of maintenance and better depth. 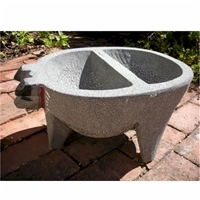 Our Mexican pig head molcajete is NOT made of concrete or conglomerate but solid basalt stone. The carvers use "power" tools to smooth the stone. Each piece is hand made so measurements are "average". Height 5.5", outside diameter 8", capacity about 4+ cups. Pestle 4.5" long. Includes escobeta, cleaning brush. Painting decoration color may vary. ** 9/21/16 This shipment is particularly nice with 4+ cup capacity. "For many years Rick searched. He searched all over. In catalogs and on the web, through markets and stores around the country. Finally, he found a quality Molcajete - that great, dense stone mortar and pestle they use so often in Mexico. So, if you can't fit a molcajete in your luggage on the way back from Mexico, head to Gourmetsleuth.com. They sell traditional stone molcajetes and deliver them to your door. Make sure you follow the instructions to season appropriately before using." from Longmont He ain't heavy, he's my molcajete. I'm pleased with the looks and function. This is a very solid and quality (and heavy) molcajete. 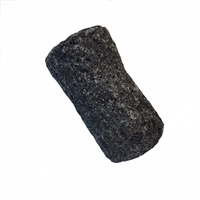 They all vary, of course, but this one is pretty rough, which is good for grinding, but it has some voids about the size of a short-grain rice (gas bubbles in the lava) that can trap whatever you're grinding and make it imperative to clean it well. That is likely for any of them. The tejolote is quite substantial. It is a comfortable grip for my medium sized male hands, but if your hands are small it may be a consideration. Seasoning this molcajete took quite a bit of effort. Yours might take less, but realize that it will take some effort and you won't be happy with the results if you don't do it well. I would like to respond to your inquiry for the review. I received the mortar and pestle and am very satisfied! Thank you for the attention to detail and the way it was presented when I opened the shipping box!